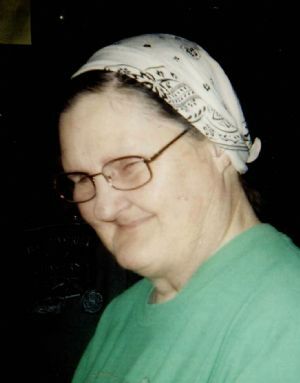 Goldie Marie Anderson, age 75, of Ripon, WI, passed away on Friday, September 28, 2018, with family by her side. Goldie was born February 25, 1943, in Waukegan, IL, the daughter of Frank James and Helen Berneace (Oerline) Pavek. On March 8, 1958, she married Donald Eugene Anderson, Sr. Goldie worked for various factories in the area. Survivors include her children, Donald E. Anderson, Jr. of Mauston, WI, Diane M. (Eddy) Roberts of Ripon, WI, Ronald G. (Sandra) Anderson of Wautoma, WI, Dale W. (Roxanne) Anderson of Oshkosh, WI, Cheryl K. (Dennis) Diamond of Ripon, WI and James R. Anderson of Washington; grandchildren, Chad (Carma) Cody, Melissa (Mark) Camposagrado, Brandon (Megan) Cody, Jennifer (Mark) Krueger, Rob Roberts, Cheyenne and Gunner Anderson, Aaron Beier, Melissa Krause, Angel, Kayla and Samantha Diamond, Lurlena and Lorelei Anderson; great-grandchildren, Evey and Colt, Kensington, Mason, Shaun, and Samuel, Kacie and Sammy. She was preceded in death by her parents, Frank and Helen; husband, Donald E. Anderson, Sr. in 2000; sister, Helen Sue Miller and brother, Franklin John Pavek. Visitation for Goldie will be held on Thursday, October 4, 2018, from 11 � 1:00 pm at Butzin-Marchant Funeral Home, 515 Mayparty Dr., Ripon, WI 54971. Funeral Service for Goldie will be held on Thursday, October 4, 2018, at 1:00 pm at Butzin-Marchant Funeral Home in Ripon with Reverend Erik Boulier officiating. Inurnment will take place at a later date at Loper Cemetery in the Town of Ripon. A memorial is being established in her name.